The Köppen climate classification is one of the most widely used climate classification systems. 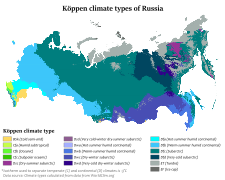 It was first published by the Russian climatologist Wladimir Köppen (1846–1940) in 1884, with several later modifications by Köppen, notably in 1918 and 1936. Later, the climatologist Rudolf Geiger (1954, 1961) introduced some changes to the classification system, which is thus sometimes called the Köppen–Geiger climate classification system. The Köppen climate classification divides climates into five main climate groups, with each group being divided based on seasonal precipitation and temperature patterns. The five main groups are A (tropical), B (dry), C (temperate), D (continental), and E (polar). Each group and subgroup is represented by a letter. All climates are assigned a main group (the first letter). All climates except for those in the E group are assigned a seasonal precipitation subgroup (the second letter). For example, Af indicates a tropical rainforest climate. The system assigns a temperature subgroup for all groups other than those in the A group, indicated by the third letter for climates in B, C, and D, and the second letter for climates in E. For example, Cfb indicates an oceanic climate with warm summers as indicated by the ending b. Climates are classified based on specific criteria unique to each climate type. Köppen designed the system based on his experience as a botanist, so the main climate groups are based on the different variety of vegetation that grows in climates belonging to each group. In addition to identifying climates, the system can be used to analyze ecosystem conditions and identify the main types of vegetation within climates. Due to its link with the plant life of a region, the system is useful in predicting future changes in plant life within a region. The Köppen climate classification scheme divides climates into five main climate groups: A (tropical), B (dry), C (temperate), D (continental), and E (polar). The second letter indicates the seasonal precipitation type, while the third letter indicates the level of heat. Summers are defined as the 6 month period that is warmer either from April–September and/or October–March while winter is the 6 month period that is cooler. This type of climate has every month of the year with an average temperature of 18 °C (64.4 °F) or higher, with significant precipitation. Af = Tropical rainforest climate; average precipitation of at least 60 mm (2.4 in) in every month. Am = Tropical monsoon climate; driest month (which nearly always occurs at or soon after the "winter" solstice for that side of the equator) with precipitation less than 60 mm (2.4 in), but more than 4% the total annual precipitation. Aw or As = Tropical wet and dry or savanna climate; with the driest month having precipitation less than 60 mm (2.4 in) and less than 4% of the total annual precipitation. This type of climate is defined by little precipitation. (c) 0 if less than 30% of the total precipitation is received during the spring and summer. If the annual precipitation is less than 50% of this threshold, the classification is BW (arid: desert climate); if it is in the range of 50%–100% of the threshold, the classification is BS (semi-arid: steppe climate). A third letter can be included to indicate temperature. Originally, h signified low-latitude climate (average annual temperature above 18 °C (64.4 °F)) while k signified middle-latitude climate (average annual temperature below 18 °C), but the more common practice today, especially in the United States, is to use h to mean the coldest month has an average temperature above 0 °C (32 °F) (or −3 °C (27 °F)), with k denoting that at least one month's averages below 0 °C (or −3 °C (27 °F)). The n is used to denote a climate characterized by frequent fog. This type of climate has the coldest month averaging between 0 °C (32 °F) (or −3 °C (27 °F)) and 18 °C (64.4 °F) and at least one month averaging above 10 °C (50 °F). Cfa = Humid subtropical climate; coldest month averaging above 0 °C (32 °F) (or −3 °C (27 °F)), at least one month's average temperature above 22 °C (71.6 °F), and at least four months averaging above 10 °C (50 °F). No significant precipitation difference between seasons (neither abovementioned set of conditions fulfilled). No dry months in the summer. Cfb = Temperate oceanic climate; coldest month averaging above 0 °C (32 °F) (or −3 °C (27 °F)), all months with average temperatures below 22 °C (71.6 °F), and at least four months averaging above 10 °C (50 °F). No significant precipitation difference between seasons (neither abovementioned set of conditions fulfilled). Cfc = Subpolar oceanic climate; coldest month averaging above 0 °C (32 °F) (or −3 °C (27 °F)) and 1–3 months averaging above 10 °C (50 °F). No significant precipitation difference between seasons (neither abovementioned set of conditions fulfilled). Cwa = Monsoon-influenced humid subtropical climate; coldest month averaging above 0 °C (32 °F) (or −3 °C (27 °F)), at least one month's average temperature above 22 °C (71.6 °F), and at least four months averaging above 10 °C (50 °F). At least ten times as much rain in the wettest month of summer as in the driest month of winter (alternative definition is 70% or more of average annual precipitation is received in the warmest six months). Cwb = Subtropical highland climate or Monsoon-influenced temperate oceanic climate; coldest month averaging above 0 °C (32 °F) (or −3 °C (27 °F)), all months with average temperatures below 22 °C (71.6 °F), and at least four months averaging above 10 °C (50 °F). At least ten times as much rain in the wettest month of summer as in the driest month of winter (an alternative definition is 70% or more of average annual precipitation received in the warmest six months). Cwc = Cold subtropical highland climate or Monsoon-influenced subpolar oceanic climate; coldest month averaging above 0 °C (32 °F) (or −3 °C (27 °F)) and 1–3 months averaging above 10 °C (50 °F). At least ten times as much rain in the wettest month of summer as in the driest month of winter (alternative definition is 70% or more of average annual precipitation is received in the warmest six months). Csa = Hot-summer Mediterranean climate; coldest month averaging above 0 °C (32 °F) (or −3 °C (27 °F)), at least one month's average temperature above 22 °C (71.6 °F), and at least four months averaging above 10 °C (50 °F). At least three times as much precipitation in the wettest month of winter as in the driest month of summer, and driest month of summer receives less than 30 mm (1.2 in). Csb = Warm-summer Mediterranean climate; coldest month averaging above 0 °C (32 °F) (or −3 °C (27 °F)), all months with average temperatures below 22 °C (71.6 °F), and at least four months averaging above 10 °C (50 °F). At least three times as much precipitation in the wettest month of winter as in the driest month of summer, and driest month of summer receives less than 30 mm (1.2 in). Csc = Cold-summer Mediterranean climate; coldest month averaging above 0 °C (32 °F) (or −3 °C (27 °F)) and 1–3 months averaging above 10 °C (50 °F). At least three times as much precipitation in the wettest month of winter as in the driest month of summer, and driest month of summer receives less than 30 mm (1.2 in). This type of climate has at least one month averaging below 0 °C (32 °F) (or −3 °C (27 °F)) and at least one month averaging above 10 °C (50 °F). Dfa = Hot-summer humid continental climate; coldest month averaging below −0 °C (32 °F) (or −3 °C (27 °F)), at least one month's average temperature above 22 °C (71.6 °F), and at least four months averaging above 10 °C (50 °F). No significant precipitation difference between seasons (neither abovementioned set of conditions fulfilled). Dfb = Warm-summer humid continental climate; coldest month averaging below −0 °C (32 °F) (or −3 °C (27 °F)), all months with average temperatures below 22 °C (71.6 °F), and at least four months averaging above 10 °C (50 °F). No significant precipitation difference between seasons (neither abovementioned set of conditions fulfilled). Dfc = Subarctic climate; coldest month averaging below 0 °C (32 °F) (or −3 °C (27 °F)) and 1–3 months averaging above 10 °C (50 °F). No significant precipitation difference between seasons (neither abovementioned set of conditions fulfilled). Dfd = Extremely cold subarctic climate; coldest month averaging below −38 °C (−36.4 °F) and 1–3 months averaging above 10 °C (50 °F). No significant precipitation difference between seasons (neither abovementioned set of conditions fulfilled). Dwa = Monsoon-influenced hot-summer humid continental climate; coldest month averaging below 0 °C (32 °F) (or −3 °C (27 °F)), at least one month's average temperature above 22 °C (71.6 °F), and at least four months averaging above 10 °C (50 °F). At least ten times as much rain in the wettest month of summer as in the driest month of winter (alternative definition is 70% or more of average annual precipitation is received in the warmest six months). Dwb = Monsoon-influenced warm-summer humid continental climate; coldest month averaging below 0 °C (32 °F) (or −3 °C (27 °F)), all months with average temperatures below 22 °C (71.6 °F), and at least four months averaging above 10 °C (50 °F). At least ten times as much rain in the wettest month of summer as in the driest month of winter (alternative definition is 70% or more of average annual precipitation is received in the warmest six months). Dwc = Monsoon-influenced subarctic climate; coldest month averaging below 0 °C (32 °F) (or −3 °C (27 °F)) and 1–3 months averaging above 10 °C (50 °F). At least ten times as much rain in the wettest month of summer as in the driest month of winter (alternative definition is 70% or more of average annual precipitation is received in the warmest six months). Dwd = Monsoon-influenced extremely cold subarctic climate; coldest month averaging below −38 °C (−36.4 °F) and 1–3 months averaging above 10 °C (50 °F). At least ten times as much rain in the wettest month of summer as in the driest month of winter (alternative definition is 70% or more of average annual precipitation is received in the warmest six months). Dsa = Mediterranean-influenced hot-summer humid continental climate; coldest month averaging below 0 °C (32 °F) (or −3 °C (27 °F)), average temperature of the warmest month above 22 °C (71.6 °F) and at least four months averaging above 10 °C (50 °F). At least three times as much precipitation in the wettest month of winter as in the driest month of summer, and driest month of summer receives less than 30 mm (1.2 in). Dsb = Mediterranean-influenced warm-summer humid continental climate; coldest month averaging below 0 °C (32 °F) (or −3 °C (27 °F)), average temperature of the warmest month below 22 °C (71.6 °F) and at least four months averaging above 10 °C (50 °F). At least three times as much precipitation in the wettest month of winter as in the driest month of summer, and driest month of summer receives less than 30 mm (1.2 in). Dsc = Mediterranean-influenced subarctic climate; coldest month averaging below 0 °C (32 °F) (or −3 °C (27 °F)) and 1–3 months averaging above 10 °C (50 °F). At least three times as much precipitation in the wettest month of winter as in the driest month of summer, and driest month of summer receives less than 30 mm (1.2 in). Dsd = Mediterranean-influenced extremely cold subarctic climate; coldest month averaging below −38 °C (−36.4 °F) and 1–3 months averaging above 10 °C (50 °F). At least three times as much precipitation in the wettest month of winter as in the driest month of summer, and driest month of summer receives less than 30 mm (1.2 in). This type of climate has every month of the year with an average temperature below 10 °C (50 °F). ET = Tundra climate; average temperature of warmest month between 0 °C (32 °F) and 10 °C (50 °F). EF = Ice cap climate; eternal winter, with all 12 months of the year with average temperatures below 0 °C (32 °F). All 12 months have an average precipitation of at least 60 mm (2.4 in). These climates usually occur within 10° latitude of the equator. This climate has no natural seasons in terms of thermal and moisture changes.. When it is dominated most of the year by the doldrums low-pressure system due to the presence of the Intertropical Convergence Zone (ITCZ) and when they are no cyclones then the climate is qualified as equatorial. When the trade winds are dominant most of the year, the climate is a tropical trade-wind rainforest climate. Some of the places with this climate are indeed uniformly and monotonously wet throughout the year (e.g., the northwest Pacific coast of South and Central America, from Ecuador to Costa Rica; see, for instance, Andagoya, Colombia), but in many cases, the period of higher sun and longer days is distinctly wettest (as at Palembang, Indonesia) or the time of lower sun and shorter days may have more rain (as at Sitiawan, Malaysia). Among these places some have a pure equatorial climate (Balikpapan, Kuala Lumpur, Kuching, Lae, Medan, Paramaribo, Pontianak and Singapore) with the dominant ITCZ aerological mechanism and no cyclones or a subequatorial climate with occasional cyclones (Davao, Ratnapura, Victoria). Most places that have this climate are found at the outer margins of the tropical zone from the low teens to the mid-20s latitudes, but occasionally an inner-tropical location (e.g., San Marcos, Antioquia, Colombia) also qualifies. Actually, the Caribbean coast, eastward from the Gulf of Urabá on the Colombia–Panamá border to the Orinoco River delta, on the Atlantic Ocean (about 4,000 km), have long dry periods (the extreme is the BSh climate (see below), characterised by very low, unreliable precipitation, present, for instance, in extensive areas in the Guajira, and Coro, western Venezuela, the northernmost peninsulas in South America, which receive <300 mm total annual precipitation, practically all in two or three months). This condition extends to the Lesser Antilles and Greater Antilles forming the circum-Caribbean dry belt. The length and severity of the dry season diminishes inland (southward); at the latitude of the Amazon River—which flows eastward, just south of the equatorial line—the climate is Af. East from the Andes, between the dry, arid Caribbean and the ever-wet Amazon are the Orinoco River's llanos or savannas, from where this climate takes its name. Sometimes As is used in place of Aw if the dry season occurs during the time of higher sun and longer days (during summer). This is the case in parts of Hawaii, northwestern Dominican Republic, East Africa, and the Brazilian Northeastern Coast. In most places that have tropical wet and dry climates, however, the dry season occurs during the time of lower sun and shorter days because of rain shadow effects during the 'high-sun' part of the year. According to the modified Köppen classification system used by modern climatologists, total precipitation in the warmest six months of the year is taken as reference instead of the total precipitation in the high-sun half of the year. A third letter can be included to indicate temperature. Originally, h signified low-latitude climate (average annual temperature above 18 °C) while k signified middle-latitude climate (average annual temperature below 18 °C), but the more common practice today, especially in the United States, is to use h to mean the coldest month has an average temperature above 0 °C (32 °F) (or −3 °C (27 °F)), with k denoting that at least one month averages below 0 °C. Desert areas situated along the west coasts of continents at tropical or near-tropical locations characterized by frequent fog and low clouds, despite the fact that these places rank among the driest on earth in terms of actual precipitation received are labelled BWn with the n denoting a climate characterized by frequent fog. The BSn category can be found in foggy coastal steppes. Death Valley, California, United States (BWh), location of the hottest air temperature ever recorded on Earth. In the Koppen climate system, temperate climates are defined as having an average temperature above 0 °C (32 °F) (or −3 °C (26.6 °F), as noted previously) in their coldest month but below 18 °C (64.4 °F). The average temperature of −3 °C (26.6 °F) roughly coincides with the equatorward limit of frozen ground and snowcover lasting for a month or more. The second letter indicates the precipitation pattern—w indicates dry winters (driest winter month average precipitation less than one-tenth wettest summer month average precipitation. s indicates at least three times as much rain in the wettest month of winter as in the driest month of summer. f means significant precipitation in all seasons (neither above-mentioned set of conditions fulfilled). The third letter indicates the degree of summer heat—a indicates warmest month average temperature above 22 °C (71.6 °F) while b indicates warmest month averaging below 22 °C but with at least four months averaging above 10 °C (50.0 °F), and c indicates less than four months averaging above 10 °C (50.0 °F). Dry-summer climates sometimes extend to additional areas (sometimes well north, or south of) typical Mediterranean climates, however the warmest month mean does not reach 22 °C (71.6 °F) they are classified as (Csb). Some of these areas would border the Oceanic climate (Cfb), except their dry-summer patterns meet Köppen's Cs minimum thresholds. Cold summer Mediterranean climates (Csc) exist in high-elevation areas adjacent to coastal Csb climate areas, where the strong maritime influence prevents the average winter monthly temperature from dropping below 0 °C. This climate is rare and is predominantly found in climate fringes and isolated areas of the Cascades and Andes Mountains, as the dry-summer climate extends further poleward in the Americas than elsewhere. Rare instances of this climate can be found in some coastal locations in the North Atlantic and at high altitudes in Hawaii. These climates usually occur on the eastern coasts and eastern sides of continents, usually in the high 20s and 30s latitudes. Unlike the dry summer Mediterranean climates, humid subtropical climates have a warm and wet flow from the tropics that creates warm and moist conditions in the summer months. As such, summer (not winter as is the case in Mediterranean climates) is often the wettest season. Cfb climates usually occur in the higher middle latitudes on the western sides of continents between the latitudes of 40° and 60°; they are typically situated immediately poleward of the Mediterranean climates, although in Australia and extreme southern Africa this climate is found immediately poleward of temperate climates, and at a somewhat lower latitude. In western Europe, this climate occurs in coastal areas up to 63°N in Norway. Subtropical Highland climates with uniform rainfall (Cfb) are a type of oceanic climate mainly found in highlands of Australia, such as in or around the Great Dividing Range in the states of New South Wales and Victoria, and also sparsely in other continents, such as in South America, among others. Unlike a typical Cwb climate, they tend to have rainfall spread evenly throughout the year. They have characteristics of both the Cfb and Cfa climates. Though unlike these climates, they have a high diurnal temperature variation and low humidity, owing to their inland location and relatively high elevation. Subpolar oceanic climates (Cfc) occur poleward of or at higher elevations than the maritime temperate climates, and are mostly confined either to narrow coastal strips on the western poleward margins of the continents, or, especially in the Northern Hemisphere, to islands off such coasts. They occur in both hemispheres, most often at latitudes from 60° north and south to 70° north and south. Cwa is monsoonal influenced, having the classic dry winter/wet summer pattern associated with tropical monsoonal climates. Dry-winter subtropical highland climate (Cwb) is a type of climate mainly found in highlands inside the tropics of Central America, South America, Africa and Asia or areas in the subtropics. Winters are noticeable and dry, and summers can be very rainy. In the tropics, the rainy season is provoked by the tropical air masses and the dry winters by subtropical high pressure. These climates have an average temperature above 10 °C (50 °F) in their warmest months, and a coldest month average below 0 °C (or −3 °C (27 °F), as noted previously). These usually occur in the interiors of continents and on their upper east coasts, normally north of 40°N. In the Southern Hemisphere, group D climates are extremely rare due to the smaller land masses in the middle latitudes and the almost complete absence of land at 40–60°S, existing only in some highland locations. In eastern Asia, Dwa climates extend further south due to the influence of the Siberian high pressure system, which also causes winters there to be dry, and summers can be very wet because of monsoon circulation. Dfb climates are immediately poleward of hot summer continental climates, generally in the high 40s and low 50s latitudes in North America and Asia, and also extending to higher latitudes in central and eastern Europe and Russia, between the maritime temperate and continental subarctic climates, where it extends up to 65 degrees latitude in places. Places with this climate have severe winters, with the temperature in their coldest month lower than −38 °C. These climates occur only in eastern Siberia. The names of some of the places with this climate have become veritable synonyms for extreme, severe winter cold. Tundra climate (ET and ET): Warmest month has an average temperature between 0 and 10 °C. These climates occur on the northern edges of the North American and Eurasian land masses (generally north of 70 °N although it may be found farther south depending on local conditions), and on nearby islands. ET climates are also found on some islands near the Antarctic Convergence, and at high elevations outside the polar regions, above the tree line. Ice cap climate (EF): This climate is dominant in Antarctica and inner Greenland, but also occurs at extremely high altitudes on mountains, above even tundra. Monthly average temperatures never exceed 0 °C (32 °F). In 2015, a Nanjing University paper published in Nature analyzing climate classifications found that between 1950 and 2010, approximately 5.7% of all land area worldwide had moved from wetter and colder classifications to drier and hotter classifications. The authors also found that the change "cannot be explained as natural variations but are driven by anthropogenic factors." For example, under the standard Köppen system, in the United States, western Washington and Oregon are classed into the same climate zone as southern California, even though the two regions have strikingly different weather and vegetation. Under the old Köppen system cool oceanic climates like that of London or Seattle were classed in the same zone as hot subtropical cities like Savannah, Georgia or Brisbane, Australia. In the United States, locations like Colorado and Kansas, which have long, severe winter climates where plants are completely dormant, were classed into the same climate zone as Louisiana or northern Florida which have mild winters and a green winter landscape. ^ a b c d e f g h i j k l Beck, Hylke E.; Zimmermann, Niklaus E.; McVicar, Tim R.; Vergopolan, Noemi; Berg, Alexis; Wood, Eric F. (30 October 2018). "Present and future Köppen-Geiger climate classification maps at 1-km resolution". Scientific Data. 5: 180214. Bibcode:2018NatSD...580214B. doi:10.1038/sdata.2018.214. ISSN 2052-4463. PMC 6207062. PMID 30375988. ^ Köppen, Wladimir (1884). Translated by Volken, E.; Brönnimann, S. "Die Wärmezonen der Erde, nach der Dauer der heissen, gemässigten und kalten Zeit und nach der Wirkung der Wärme auf die organische Welt betrachtet" [The thermal zones of the earth according to the duration of hot, moderate and cold periods and to the impact of heat on the organic world)]. Meteorologische Zeitschrift (published 2011). 20 (3): 351–360. Bibcode:2011MetZe..20..351K. doi:10.1127/0941-2948/2011/105 – via http://www.ingentaconnect.com/content/schweiz/mz/2011/00000020/00000003/art00009. ^ Rubel, F.; Kottek, M (2011). "Comments on: 'The thermal zones of the Earth' by Wladimir Köppen (1884)". Meteorologische Zeitschrift. 20 (3): 361–365. Bibcode:2011MetZe..20..361R. doi:10.1127/0941-2948/2011/0258. ^ Köppen, Wladimir (1918). "Klassification der Klimate nach Temperatur, Niederschlag and Jahreslauf". Petermanns Geographische Mitteilungen. 64. pp. 193–203, 243–248 – via http://koeppen-geiger.vu-wien.ac.at/koeppen.htm. ^ Köppen, Wladimir (1936). "C". In Köppen, Wladimir; Geiger (publisher), Rudolf (eds.). Das geographische System der Klimate [The geographic system of climates] (PDF). Handbuch der Klimatologie. 1. Berlin: Borntraeger. ^ Geiger, Rudolf (1954). "Klassifikation der Klimate nach W. Köppen" [Classification of climates after W. Köppen]. Landolt-Börnstein – Zahlenwerte und Funktionen aus Physik, Chemie, Astronomie, Geophysik und Technik, alte Serie. Berlin: Springer. 3. pp. 603–607. ^ Geiger, Rudolf (1961). Überarbeitete Neuausgabe von Geiger, R.: Köppen-Geiger / Klima der Erde. (Wandkarte 1:16 Mill.) – Klett-Perthes, Gotha. ^ a b c d e f g Kottek, Markus; Grieser, Jürgen; Beck, Christoph; Rudolf, Bruno; Rubel, Franz (2006). "World Map of the Köppen-Geiger climate classification updated". Meteorologische Zeitschrift. 15 (3): 259–263. Bibcode:2006MetZe..15..259K. doi:10.1127/0941-2948/2006/0130. ^ Beck, Hylke E.; Zimmermann, Niklaus E.; McVicar, Tim R.; Vergopolan, Noemi; Berg, Alexis; Wood, Eric F. (30 October 2018). "Present and future Köppen-Geiger climate classification maps at 1-km resolution". Scientific Data. 5: 180214. Bibcode:2018NatSD...580214B. doi:10.1038/sdata.2018.214. ISSN 2052-4463. PMC 6207062. PMID 30375988. ^ a b c d e f g h i j k l m McKnight, Tom L; Hess, Darrel (2000). "Climate Zones and Types". Physical Geography: A Landscape Appreciation. Upper Saddle River, NJ: Prentice Hall. ISBN 978-0-13-020263-5. ^ a b c d e f g h i j k Peel, M. C.; Finlayson B. L. & McMahon, T. A. (2007). "Updated world map of the Köppen–Geiger climate classification" (PDF). Hydrol. Earth Syst. Sci. 11 (5): 1633–1644. doi:10.5194/hess-11-1633-2007. ISSN 1027-5606. ^ "Koppen climate classification | climatology". Encyclopedia Britannica. Retrieved 2017-08-04. ^ a b Chen, Hans; Chen, Deliang. "Köppen climate classification". hanschen.org. Retrieved 2017-08-04. ^ a b Cereceda, P.; Larrain, H.; osses, P.; Farias, M.; Egaña, I. (2008). "The climate of the coast and fog zone in the Tarapacá Region, Atacama Desert, Chile". Atmospheric Research. 87 (3–4): 301–311. Bibcode:2008AtmRe..87..301C. doi:10.1016/j.atmosres.2007.11.011. Retrieved 21 January 2018. ^ a b "CLASIFICACIÓN CLIMÁTICA DE KÖPPEN" (in Spanish). Universidad de Chile. Archived from the original on 22 January 2018. Retrieved 21 January 2018. ^ a b Inzunza, Juan. "Capitulo 15. Climas de Chile" (PDF). Meteorología Descriptiva y Aplicaciones en Chile (in Spanish). p. 427. Archived from the original (PDF) on 22 January 2018. Retrieved 22 January 2018. ^ "Climatologie" by Pierre Estienne and Alain Godard, Éditions Armand Colin (ISBN 2-200-31042-0) , "CHAPITRE XVI 1. Les climats équatoriaux et subéquatoriaux 2. Les climats tropicaux 3. Les climats d'alizé 4. Les climats de montagne LES CLIMATS DE LA ZONE INTERTROPICALE : LES VARIÉTÉS" pages 308-323. ^ "JetStream Max: Addition Köppen-Geiger Climate Subdivisions". National Weather Service. Archived from the original on 24 December 2018. Retrieved 24 December 2018. ^ "Atlas Agroclimático de Chile–Estado Actual y Tendencias del Clima (Tomo I: Regiones de Arica Y Parinacota, Tarapacá y Antofagasta" (in Spanish). Universidad de Chile. 2017. Retrieved 9 December 2018. ^ Melvin R. George. "Mediterranean Climate". UCRangelands. University of California. Archived from the original on 2016-03-04. Retrieved 2015-01-26. ^ Critchfield, Howard J (1983). General Climatology (4th ed.). New Delhi: Prentice Hall. pp. 154–161. ISBN 978-81-203-0476-5. Wikimedia Commons has media related to Köppen-Geiger.